Full-feature, fully flexible, easy-to-handle, fast and efficient cell transfection devices. Full flexibility for use with broadest range of cell types including difficult to transfect neuronal cells, stem cells and primary cells. Fully interchangeable 6-well, 24-well AND 96-well formats. Easy to program with user-defined protocols (oscillation frequency, displacement, cycles, time). Quick, easy optimisation of transfection conditions for maximum flexibility and best possible transfection results. The magnefect-nano-II magnet array sample holder comes with fully interchangeable magnet arrays (6-well, 24-well AND 96-well) for standard multi-well plates. The sample holder may be placed in a cell incubator during transfection to maintain the normal cell culture environment. The magnefect-nano-II controller unit supplies power to oscillate the magnet array and allows you to define user protocols (e.g. oscillating frequency, oscillating time, oscillating displacement). 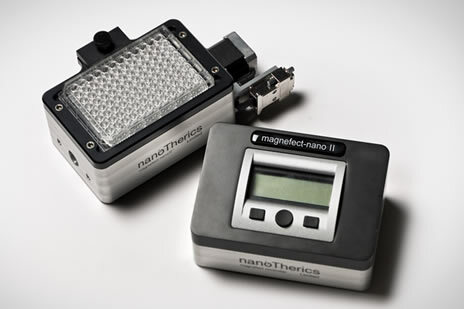 The magnefect-nano-II controller unit can also be used to provide power to a magnefect-nano-II-DUO sample holder. The magnefect-nano-II comes provided with a 6-well, a 24-well AND a 96-well magnet array which are fully interchangeable allowing user flexibility. Additional magnet arrays and magnet array sample holders can be purchased as required.